Anna Madden Living: "Happy Halloween!" I took the kids to halloween party at Benny's school today. 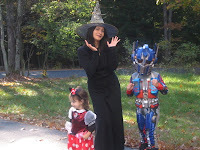 Benny became Transformer Optimus Prime, Thia became Minie Mouse, and I became a witch. It was a fun party with a lot of singing and dancing. 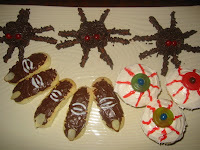 For the first time in 3 years, I made treats for Benny's school halloween party. I made 27 eyeball cupcakes. I forgot that everyone always bring cupcakes too. Next time I will make something simple like my friend Laura's witch hat cookies. She didn't even bake them. And it was a big hit!